Spring Locator I.D. 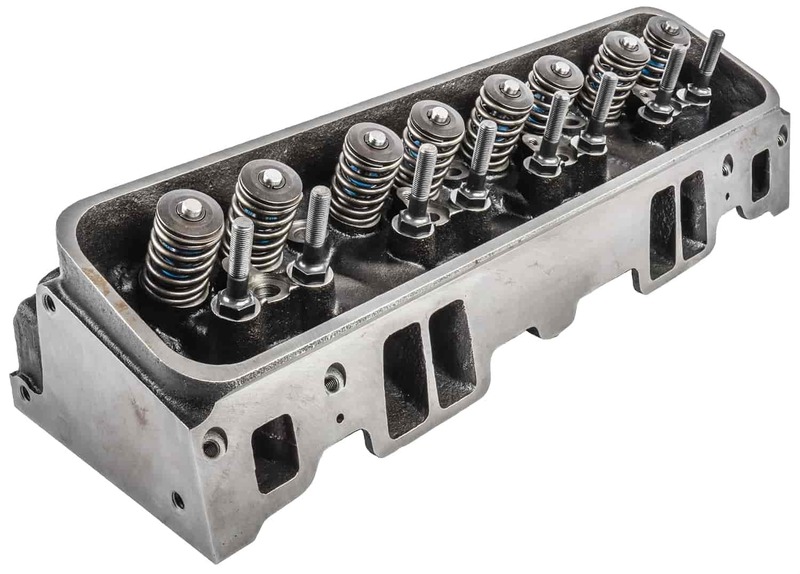 Locator - 1.253" x 0.120"
1.250" Single 0.475" 80# @ 1.700" 1.200"
JEGS Cast Iron Vortec Cylinder Head has fast burn combustion chambers and high-velocity intake and exhaust ports. This head performs great right out of the box but can be mildly ported and milled up to 0.040 in. and requires a Vortec-style intake manifold; modifying the head to accept an early intake manifold is not recommended. Assembled with premium parts JEGS Vortec Head fits all 1955-Present GM small blocks except LT1, LT4, and LS1-style engines. 514080 is rated 2.5 out of 5 by 2. Rated 3 out of 5 by Don541 from OK I purchased a pair to replace the 193 TBI heads I had on my van. The heads are OK, but have very poor work under the valve seats, some ports are shifted making a large step between the port and the seat. It takes a bit of clean up to make it right. I have used much cleaner castings in this area. For the price I am not unhappy, just glad I looked before just bolting them on. The heads do have some type of valve guide liner. Rated 2 out of 5 by 541Don from I could not change my previous review The second head I got shipped had problems. I ended up having to take both to a machine shop to have it fixed. On disassembly of both heads there were no bronze liners. No hd anything. The heads are cheap rebuilder grade promax heads that did not have enough retainer to seal clearance for a .440 lift cam. are these ready to install or is there assemble involved valve and springs? These heads are ready to install out of the box. No, these do not show a CARB exemption number. Are the spring retainers machined to accept a larger lift spring? Looking to run around a .500 lift spring. You can change these springs out to one that will work with a .500&quot; lift camshaft. No, these are vortec heads and will require the vortec style intake manifold. I want to put these on a mild SBC 350 would I need to run guide plates or no ? Guide plates are recommended, but may not be required depending on the rocker arms used. I have a marine comp cam with .477 exhaust lift... Will my cam work with these heads seen how they say.475 max left?? Don't know if that small amount would hurt anything or not...thx. These should work in this application, but you will need to check for coil bind and valve spring clearance once these are installed. Will these work on a 1998 k1500 5.0 litre? These heads will work on any Vortec small block engine.